Welcome Home! Pigeon Pass is an entertainer’s delight in the heart of Spring Hills, a highly desired rural community in the hills of Moreno Valley. This spectacular 5 bedroom, 3 bathroom RANCH home rarely comes on the market in this serene community! Upon entering the home as you open the mahogany entry door you immediately feel “at home”. Fully upgraded in 2009, an additional 2000 sq. ft. of permitted space was completed with the finest appointments. The flooring and counter selections have been tastefully done in neutral colors to suit everyone’s taste in decor. Mosaic tile, tile, granite and hardwood have been used throughout the home. The kitchen features stainless steel appliances, stunning leaded glass doors, and an abundance of storage with Lazy Susans, pull-out shelves and a robust walk-in pantry. Downstairs you’ll find your elegantly planned 14’x19′ Master Suite complete with a generous 14.4’x15′ Retreat with wet-bar and beautiful french doors leading to your private patio overlooking the most break-taking views of the surrounding cities. Your Master opens to it’s magnificent bathroom with 2 person shower that has separate controls for each with 10 sprays and serviced by a tankless water heater. The jacuzzi tub is 6′ with inline heater and lights. The cherry on top of the Master Suite is the spacious 10.5’x12.5′ walk-in closet complete with custom cabinetry. Additionally, downstairs you’ll enjoy a second full bathroom and 2 additional bedrooms that are convenient for those with live-in parents, out-of-town guests, a nanny or office. One of the downstairs bedrooms is wheelchair accessible and incredibly spacious at 14’x19′. Upstairs features 2 additional bedrooms, a gorgeous bathroom that is tiled with 8′ vanity cabinets 2 designer sinks and faucets. Tub and tiled shower with a dual flush toilet. To make the upstairs even more grand there is a spacious 11’x22′ loft. At just shy of 5 acres, the backyard awaits entertaining with a sprawling deck overlooking the most magnificent views. 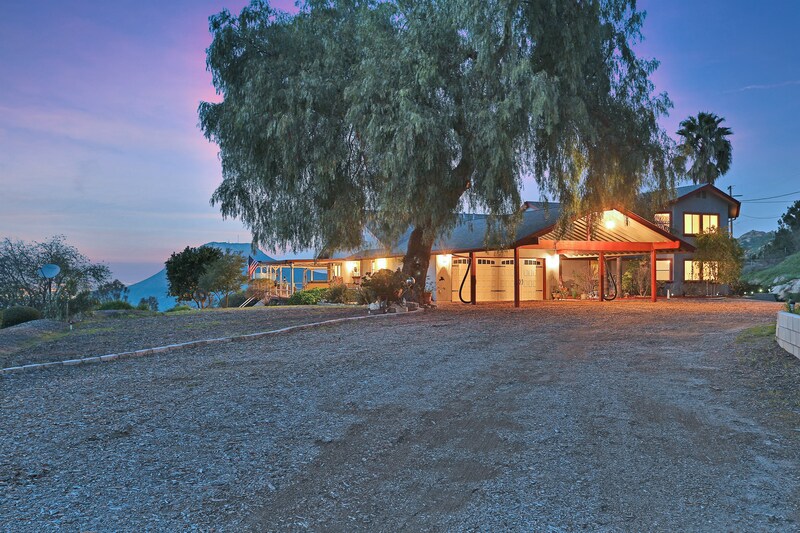 This ranch is ready for you to trailer in your horses and saddle up for a trail ride. Complete with 2 barns, a shop area with 3 RV parking stalls at 15’x30′, this home has it all! A water well is on your property and the present owners have thoughtfully added in to the city water lines. Minutes away from shopping, available for the first time on the market in 30 years, the only thing missing is YOU!